Swedish pro-Israel flotilla docks in Herzliya Marina, kicks off 11-day visit to improve Sweden's image in Israel. 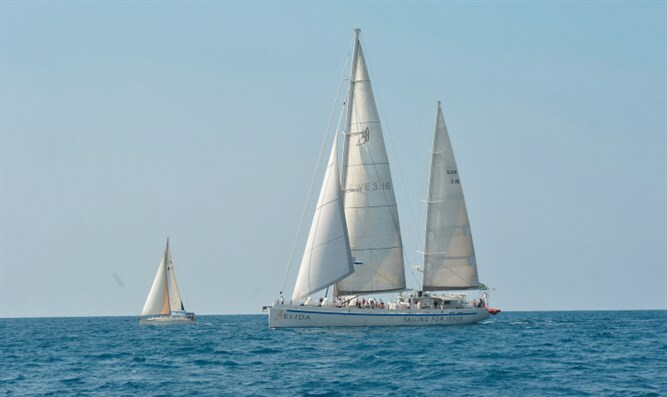 A flotilla of Swedish ships arrived in the Herzliya Marina on Israel’s Mediterranean coast Thursday night, following a roughly month-and-a-half journey from Gothenburg Sweden. Led by the ship ‘Elida’, the flotilla is part of an effort by pro-Israel Evanglical Christians in Sweden to improve their country’s image vis-à-vis the Jewish state. The trip was organized by Abrahamson, owner of the yacht, to express support for both Israel and solidarity with Middle East Christians. The Elida, a 131-foot (40-meter) yacht with some 50 passengers and crew, led the flotilla from Gothenburg, Sweden on their 48-day journey. The yacht will remain docked at the Herzliya Marina for 11 days, and will remain open to visitors looking to meet with the Swedish delegation. The flotilla departed Sweden following a similar voyage of anti-Israel activists from Sweden who attempted to breach the security blockade on the Gaza Strip.